Maijishan Scenic Spots is part of the Tentative list of China in order to qualify for inclusion in the World Heritage List. 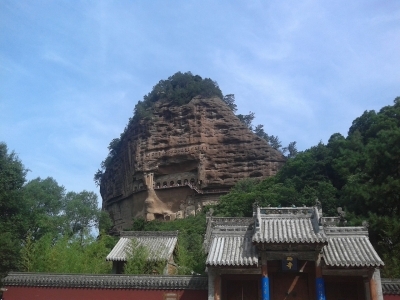 Maiji Grottoes are carved into a really large rock. It can be seen from afar. The best way to get there is from Tianshui in the Gansu province which has good flight connections across the country. Getting to the mountain is easily done by bus. When you arrive you need to walk a little to reach the actual entrance but it is an eyesore. Little do you know what follows is an actual climb up scaffolding to see the carvings and grottoes close-up. It can be scary at times and I get the feeling this is overcrowded. Get used to a lot of people moving slowly and standing around at narrow areas. There are support staff to ensure everything is safe up there. The "path" is not so linear and it would be easy to miss some parts. At one point I found myself just below the three massive carved Buddhas. The entire visit probably doesn't take more than an hour. The rest of the site from what I can make out from the rather badly written proposal should include natural sections which I assume are in nearby forest park. Definitely one of the highlights in Gansu.